This is a monthly rental only. Enjoy our home, it has everything you need for a comfortable stay. Please use a check, echeck or add 3% charge for credit cards or PayPal. WIFI, Roku, Netflix, Keurig Coffee, wireless printer, computer. Ocean view and city lights in Old Monterey Bay. Walk to downtown and Fishermen's Wharf. Our home is beautifully furnished with hardwood floors throughout, many antiques, original art and Persian rug. It is a fully equipped home with everything you need. Its' perfect for a relaxing vacation, writer's haven or a temporary work assignment. Two master bedrooms offer you comfort and individual privacy. Included is a private garage, washer, dryer and private backyard. This home is bright, light and cheery! Located in the sun belt of Monterey our home has nicely manicured yards and a quiet neighborhood. The perfect place to enjoy the best of Monterey, better than a bed and breakfast. Our home has 2 flat screen TVs, VCR, DVD, stereo, dishwasher, disposal, spacious kitchen. There’s gas log fireplace in brick with a raised hearth, hardwood floors, comfortable furnishings, bike, beach chairs and umbrella, patio furniture, a gas BBQ, and chaise lounge. Walking in Monterey is delightful whether it is to Downtown for the Tuesday Farmers Market, movies, dining, shopping or to Fishermans Wharf. Be sure to visit Monterey Bay Aquarium and Cannery Row as well. As you stroll from the Aquarium to Lovers' point along the rugged Pacific Ocean coast you will pass the wonderful old Victorians facing the sea. If you like to walk, nearly everything is within your range. Bikers have miles and miles of sea coast to enjoy. Drink in the blue waters of Monterey Bay's during the day and the lovely city lights at night. Mickie Constantino Total Transitions is my company, check me out. Near the Presidio and Monterey Institute of International Studies. Please use echeck only. If location is important, this is the place for you. It is near to everything, great restaurants, museums, ocean walks, incredible fresh fish and whale watching trips. We have now rented the apartment and the house at Mickie's property. Both are perfect and we will be back. Mickie is wonderful to work with and and Monterey is my husband's most favorite place on the planet. See you soon. Thanks for staying in our home. This is a lovely home with large comfortable rooms. The home is well supplied with all the necessities for comfortable stay. The kitchen is well equipped. The gas fireplace provides a cozy atmosphere on cool evenings. The back patio is a peaceful place to relax on sunny afternoons or for outdoor dinning. There is also a garage and washer and dryer. The location is great for visiting all the monterey area attractions. I have been spending Summer's here for the past four years. Each year I am impressed at how well maintained the property is. The home is well cared for. Mickie is immediately responsive to even the smallest of needs. This year she completely redid the front and back landscaping. I highly recommend this home. Thank you for taking such good care of my home. Please come again soon. We have stayed in Mickies home for several years and consider it our home in Monterey. Love the convenient location and easy access to everything. We'll defiantly be back. Thanks so staying in my home. This is a lovely home with large comfortable rooms. The beds and bedding are outstanding. Mickie has decorated with care to create a warm welcoming space. The kitchen is well stocked with everything you need to prepare meals if you wish. I appreciated the included housekeeping every two weeks and having a garage which is a rarity in Monterey. The home is located within walking distance of historic downtown Monterey and Fisherman's wharf and the weekly farmers market. The only problem is the uphill return walk. 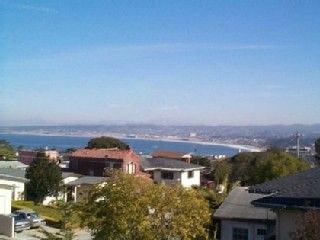 The home is centrally located so it is easy to get to Pacific Grove and Carmel. It has a large tiled patio with a small lawn and trees and shrugs to add privacy. It is a great place for enjoying meals outdoors in a sunny area. There is a view of the bay from the shady front porch from the rocking chairs. At night the view of the city lights is spectacular. This was my 3rd summer here and I continue to enjoy my stay and discover places to visit and dine. I love the aquarium and the summer "Evenings by the Bay "when the aquarium is open on Sat. nights.This is a great time to visit without the crowds and the extra benefit of live music and snacks and wine available. I am looking forward to my stay next summer. Near the Presidio and Monterey Institute of International Studies.